Comments: e-mail *Press on smaller photos to enlarge. The weather was incredible on Friday and forecasted to be just as good on Monday. As my luck would have it, the weekend promised rain. Yet one last look on NWAC and their typical 3:30 update indicated hope. Early Saturday, partly cloudy with rain in the afternoon. 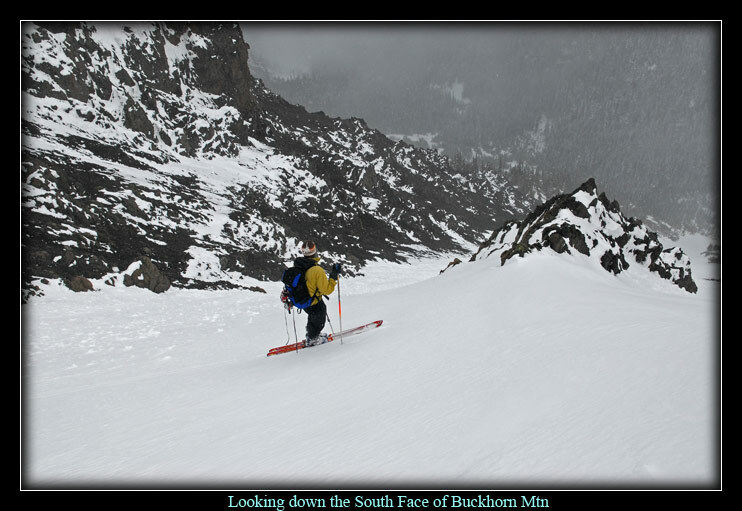 Phil and I optimistically left Friday night and arrived at Mount Washington in the Buckhorn Wilderness. That night we slept under stars and awoke to clouds. Worse yet, the North Face of Washington looked harrowing at best, and I didn't like the upper cornice hanging over the face. "Phil this doesn't look like a good ski route," I would mater-of-factly say. Sitting in Phil's Subaru, we flipped through the Climber's Guide to the Olympic Mountains finding the sketched drawling a poor remedy for a wilting excitement. Plan B became Buckhorn Mountain which looked to begin on the Big Quilcene River. Our sinisterly low motivation mounted as it began to rain. "Let's just go home, sit on the couch and watch TV." This stirred a laugh, but not any viable action. I felt better as we put feet to the trail and pounded our way toward Marmot Pass. 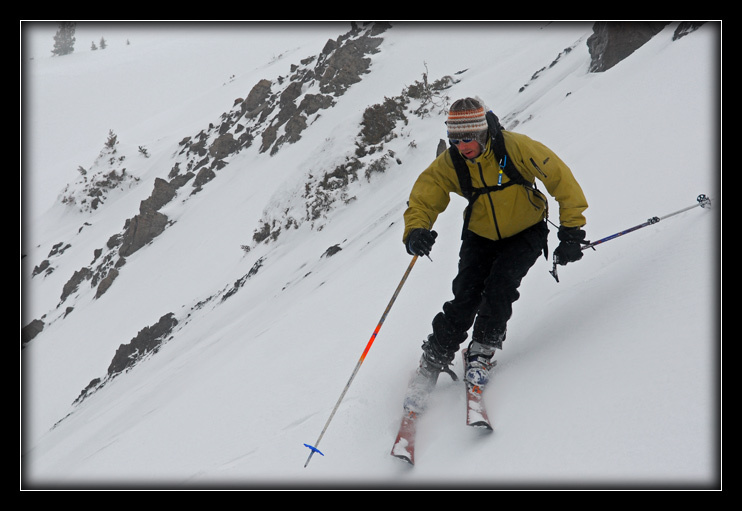 Unlike my previous hike to the NE Face of Constance with skis, this one was generously kind. Only a few fallen trees easily skirted separated a wonderful trail from our destination. We followed snowshoe tracks when the snow deepened. They suddenly ended maybe a mile before Marmot Pass. 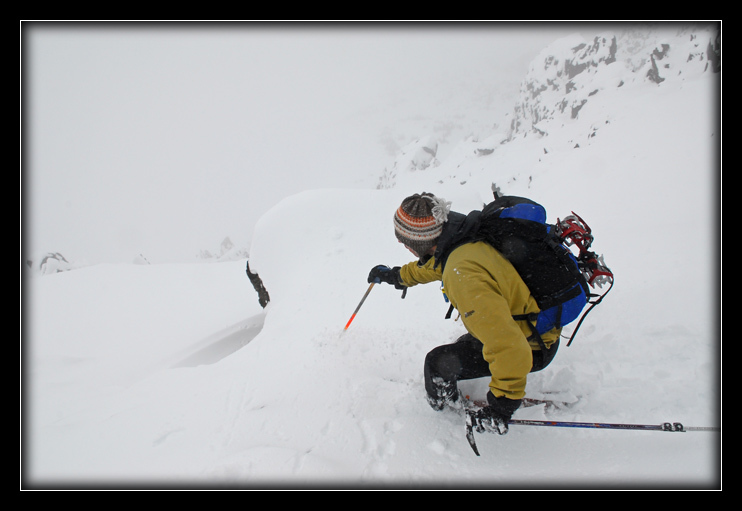 Above looked to be a fine snow gully so we switched plans and quickly booted our way 2000-ft up hard, crusty snow. Motivation was again difficult to muster under such conditions. 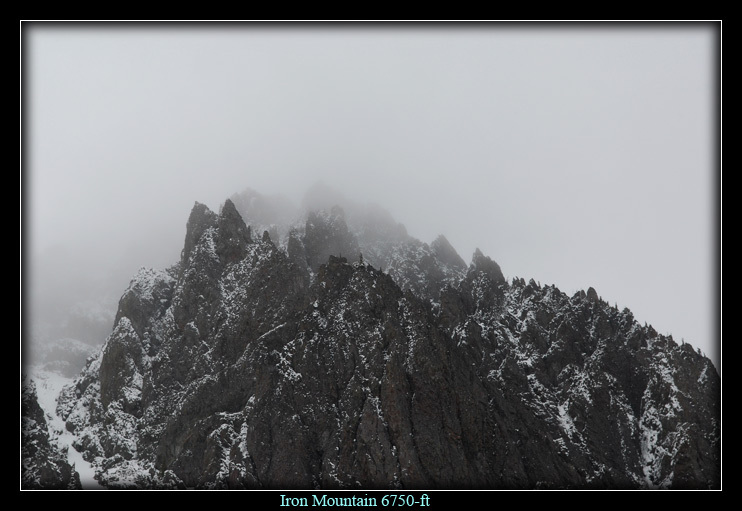 This southerly aspect held little snow and the rock was terrible, blowing chunks of sharp volcanic rock on us several times. The summit has two high points, the tallest one was what we were shooting for. At least I was. 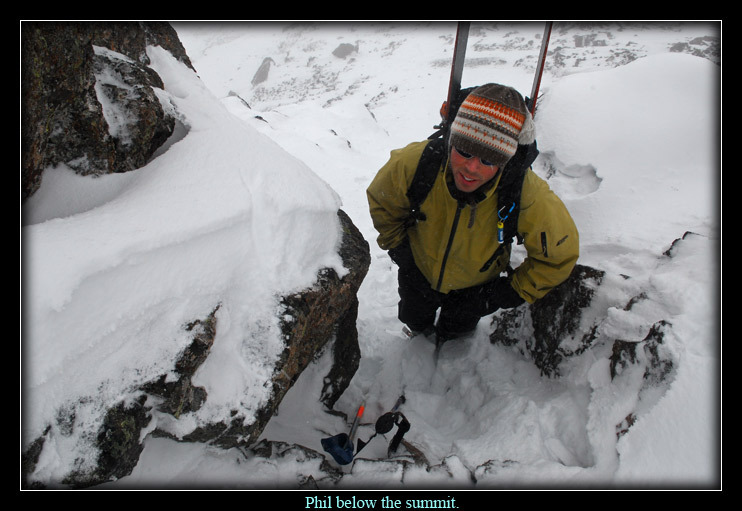 Phil wanted to stop, uninterested in searching hopelessly in the fog and blowing snow. Not willing to give up, I continued forward to see what I could of the Northern Face where, conveniently, I happened upon stones marking a trail. "Hey Phil, the trail!" We continued on the trail for only a few feet before it was lost. We kept traversing the ridge until the highest point was satisfactory reached. "Oh Yeah." "Ha. It figures the North Facing snow is amazing, doesn't it Phil?" Deciding on a sit start Phil posed for a photo on the tippy top. After which we both patched route back down to the pass. 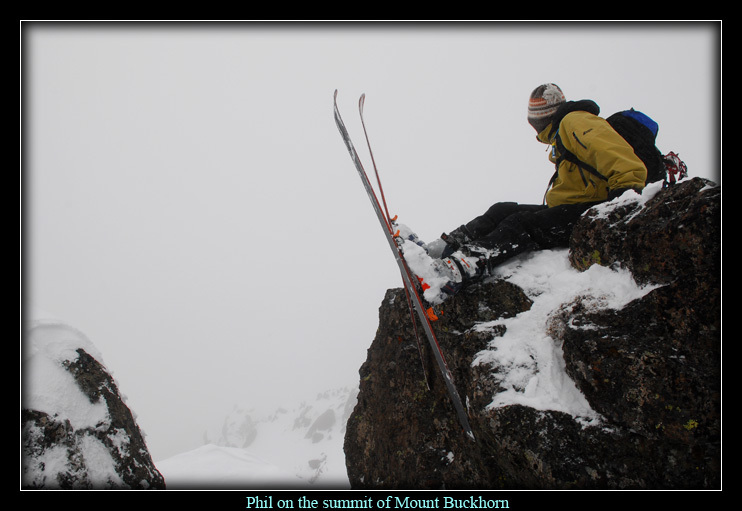 I was excited to ski off my first summit in the OLYMPICS, even if it was a bit contrived to do so! I hollered like a fool like I am apt to do when I'm skiing. 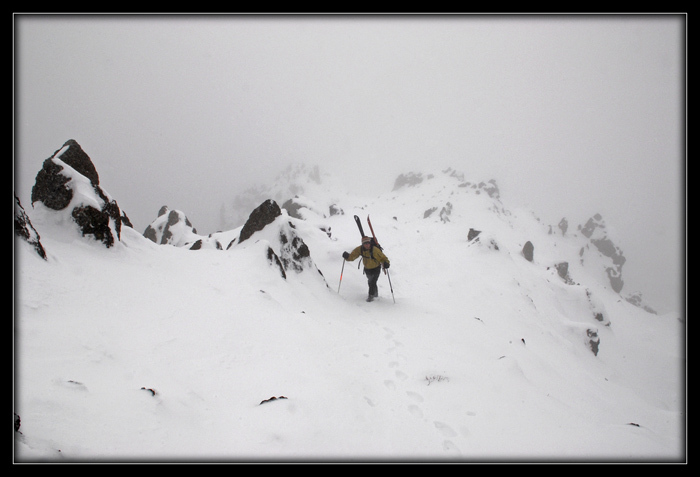 We made fast work of the gully and found that terrible hard snow not as bad as we expected it to be. I don't think that I dropped the knew once and made any telemark turns whatsoever. My knee has fallen into painful disrepair like last year. I wasn't happy about that. Trail skiing in a wild, feral-like descent disseminated that worry. Doesn't fear do such a great job of that. Die worry! Live risk! The snow was gone or at most, a few inches were left in places. As long as you didn't try to slow down, most of the scratches would be horizontal. Not that I worry about scratches. Enjoyment takes precedence over gear...always. By gods, it was worth it, what a thrilling ride! I rested on the trail looking up at the forest canopy while waiting for Phil. Before I could fall asleep he happened upon me, breaking my nostalgic thoughts. We continued mindlessly down to the Big Quilcene trailhead. At the register where Phil had actually registered it asked for you to mark climbing, fishing, or hiking. 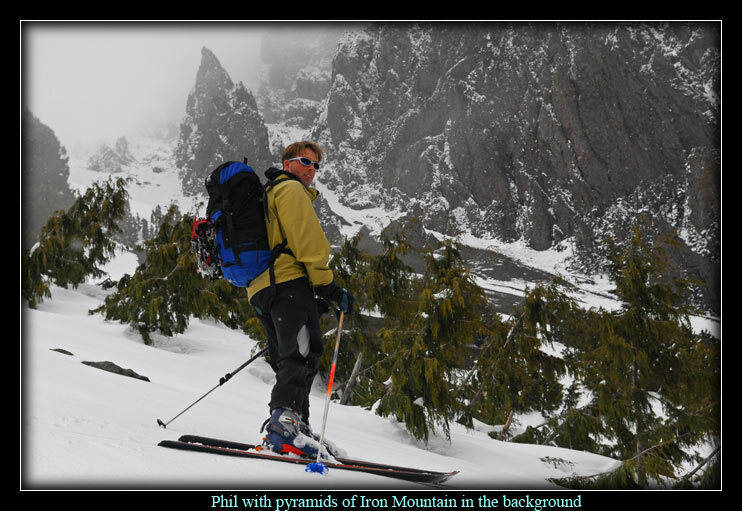 Not to be prejudiced, Phil added 'freeskiing' to the list and in the comment section where two hikers had said, 'Too much snow, too little time,' he laughingly detailed, 'To little snow, too much time.' I felt a slight bit shameful for our elitist comment, but I have to admit it was very funny. The trip ended anti-climatically, gear in the car and back on the road. I can't say that this was a spectacular trip, but I think that it could be. Marmot Pass and surrounding environs must have something worth skiing. My interest has been sufficiently piqued and I will return. 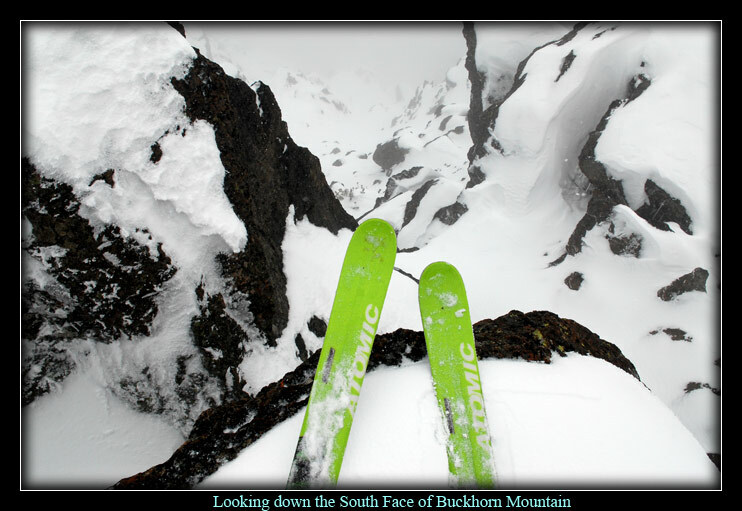 We crowned Buckhorn a 'RAISAN' and made amends to come back and ski some of the surrounding Plums. I know that the Olympics must have some and I'm willing to put in the effort to find them. Alpine State OF Mind. Or CONTACT ME. If you enjoyed your visit, tell us about it, go to the GUESTBOOK.